Six New Orleans musicians strong, the Dukes of Dixieland deliver gritty, rollicking music for a live audience from the 2015 New Orleans Jazz & Heritage Festival. 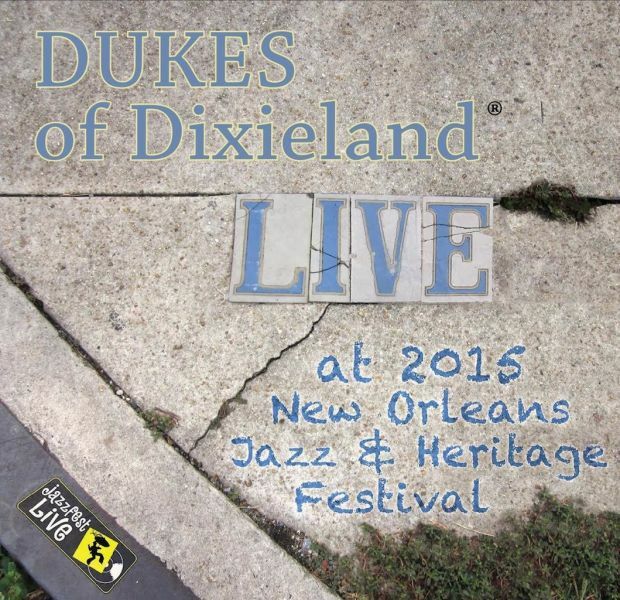 Dukes of Dixieland’s May 2, 2015 performance at last year’s New Orleans Jazz and Heritage Festival is a sonic snapshot of what audiences the world over look for in a live show. The six-man crew of the historic New Orleans band captured the set for a Sept. 18, 2015 release, available at JazzFestLive.com and produced by MunckMix. The singing’s fairly basic; it’s nothing to write home about (sorry, Kevin Clark, Joe Kennedy, Alan Broome, David Phy). But nobody really cares, because the music’s pumping and the band’s having a grand old time catering to all the audience favorites from a tried-and-true nightly repertoire on board the Steamboat Natchez by the Mississippi River. It’s a dinner cruise type of gig the Dukes of Dixieland have held for going on two decades, every night of the week, 45 weeks out of the year. All 12 tunes in the live set give the band a mixed bag of styles to choose from — with a New Orleans twist: stuff by Louis Prima (“Sing, Sing, Sing/I Wanna Be Like You [Jungle Book]”), Duke Ellington (“Ko Ko,” “Caravan/Angelica”), Tom Waits (“I Wish I Was In New Orleans”), Jerry Lee Lewis (“Shakin’/Chantilly Lace/Great Balls Of Fire”), Allen Toussaint (“Java”), Huey “Piano” Smith (“Rockin’ Pneumonia And The Boogie-Woogie Flu”), Bobby Goldsboro (“Voodoo Woman”), and Dr. John (“Such a Night,” “Down Home Girl”). Both the instrumentals and vocals contribute to that live party vibe everyone goes for at a music festival such as the popular, anything-goes New Orleans Jazzfest. “Playing for that crowd, you know that when they’re applauding and into it, you’re doing it right. We always get a good response out there, and when that many people scream and yell, it’s inspiring and amps the band up even more. It captures that over-the-top New Orleans vibe,” Clark added. That is why the vocals aren’t pure, polished perfection in the realm of a Broadway belter, or even a Kurt Elling. The vocals sound straight from the streets, just as pure, but real relatable, from one partier to another, sharing the same sense of fun and good times from the stage direct to the audience. Audiences can relate to that everyman deal, whether the band grooves into “New Orleans R&B Medley,” “I Wish I Was In New Orleans,” “Voodoo Woman,” or “Shakin’/Chantilly Lace/Great Balls Of Fire” — even if the vocals themselves aren’t pitch-perfect. Pitch-perfect vocals wouldn’t exactly fit in with this crowd. It’s actually the music that keeps the audience interested, up and dancing — the reason for any lively crowd at every outdoor festival. The musicianship of the six band members is off the charts. They play everything, in and out of ballads and frivolous come-ons, oozing Zoot Suit cool. They are Clark, who left the band after a 13-year run in 2002 but came back in 2010; pianist “Big Joe” Kennedy; bassist Alan Broome; trombonist Dr. David Phy; reedman Ryan Burrage (clarinet, sax); and drummer David Mahoney. Once Clark came back, he tried to bring a tighter focus on pure entertainment for the audience. “Sing, Sing, Sing/I Wanna Be Like You (Jungle Book)” really drives home the R&B band’s Zoot Suit clamor, from the boss percussive opening to the horns overlapping the funk with every intentional step, in the way a bayou funeral procession takes on a dreamy, tempestuous quality. “Stevedore Stomp” really gives the people in the audience a chance to shake, rattle, roll, and swing if they want to. The horn players and the bassist are the movers and shakers in this big parade band piece, throwing up herbaceous notes into the air like confetti, celebrating nihilism with abandon. Bassist Broome really got the crowd going with his Tom Waits/Louis Armstrong imitation on, “I Wish I Was In New Orleans,” one of several, crowd-pleasing vocal numbers in the live album. As much as this performance was an overly attenuated impersonation, he nailed the gritty nature of the “red beans and rice” Crescent City. His band mates did their part, playing just enough of the familiar Second Line to flesh out the party.